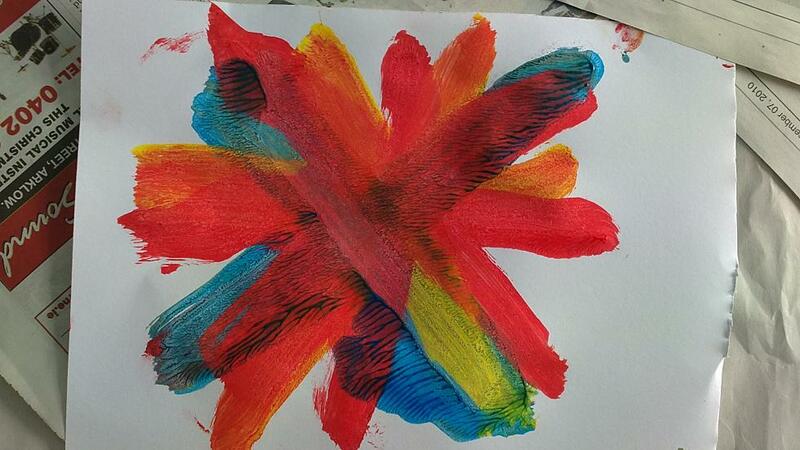 The second of eight classes for Gorey Educate Together After Schools Art Program looks at how to mix colours. Children between the ages of five and six years don't want a formal approach they want something to prompt learning and curiosity. A colour wheel would just be the wrong approach. Starting the class with a scribble session with two different coloured crayons and letting the children loosen up with a good scribble also introduced the idea of when colours layer over each other they change. For the main part of the lesson I wanted them to explore primary colours, red, blue, yellow and how mixing them produced secondary colours, green, orange and purple. So the three main colour were put out into clear plastic drinking cups and a brush placed in it. 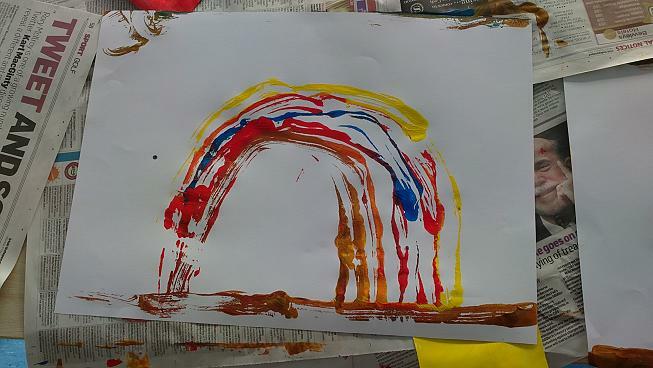 The children naturally gravitated towards their own age groups and shared paints. I cut white cartridge paper into A6 size (A4 cut evenly into four). Each of the children were given three sheets of A6 and one sheet of A3 white paper. 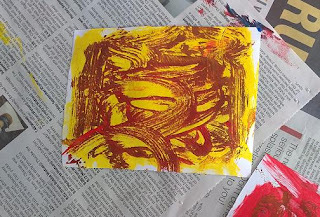 The instructions were take one small sheet and paint it completely with the first primary colour , then print the small sheet on to the big sheet. Take another small sheet and paint the next primary colour and the third primary colour until the children had painted three sheets and printed the three primary colours in layers. An A3 sheet was used as both backing paper to paint on the left side and printing paper to print on the right side. There are some very good examples I'll get some more photos of them. Of course being in the thick of the excitement I was focused on the children rather then documenting the work. Love the texture on this painted, printed A6 sheet, artist 6 years. 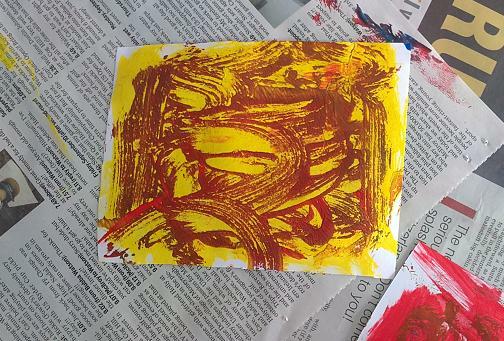 It was great to see them explore colours through print making. The printing also hight lighted great textures. I love that when you give children an idea or a task and once they grasp it if there is space for them they will take the idea and make it their own. When I work with children I try to ensure that space is there for them to flourish, experiment, play, engage, test, watch others, learn, introduce the learning, test it further, admire the results.I think we all deserve space like that. This proved to be an excellent way to get young children to explore mixing colours and I thought it useful to share. The first half of the lesson they learned the process and really looked at what they were doing, observing asking questions and exploring. Instead of the colours all ending up a mucky brown mix which can happen very quickly with this age group when mixing colours the layers kept vibrant and introduced variations of shades both on the prints and the printing page. 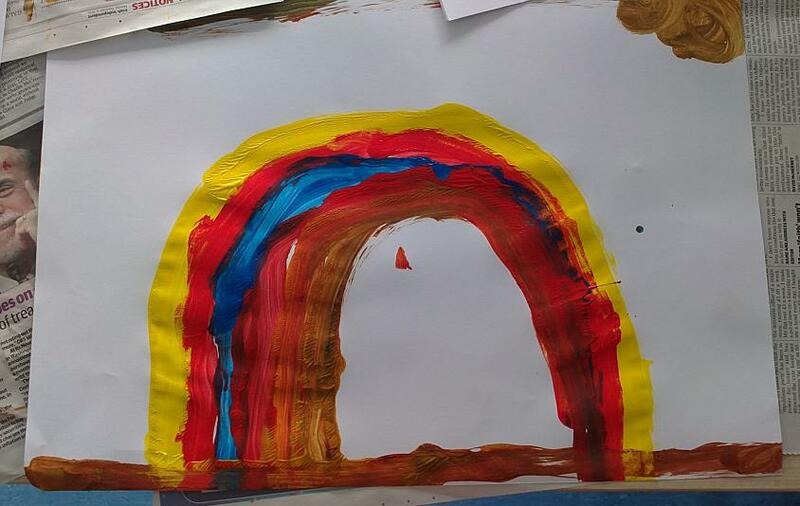 Look at these amazing rainbows painted first then the print taken off.